You can use chocolate candy making molds to produce delicious homemade chocolate candies that your family, friends, and guests will enjoy. I remember attending weddings as a child and being fascinated by the little molded chocolates in various shapes and colors. I recall chocolate candy leaf molds in shades of mint green. There were dainty little pastel chocolate molded roses. So many delights to tantalize my young taste buds! A chocolate candy making mold is a great way to introduce your children into creating homemade chocolate candy. Most kids love the idea of working with different shapes. Add chocolate to the mix and you are sure to have a real winner. What a wonderful way to build memories with your children that will last a lifetime! You can even add your creations here and show them off to friends and family living far away. Check out the different types of chocolate candy molds that are available. You may be pleasantly surprised to discover the wide range that you can choose from. heart shaped chocolate molds for Valentine's Day, etc. Believe it or not, you can buy chocolate candy molds for just about any occasion at all. You can even find chocolate lollipop molds and pretzel lollipop molds to make adorable lollipops for special occasions like birthdays, sporting events, graduation, and even Halloween. One of my favorite mold suppliers is Candyland Crafts. They have over 2500 molds to choose from and they are very inexpensive. Remember, not only can you make solid molded chocolates, you can also use your molds to make cream-filled chocolates. Mmmmm! I always have a hard time deciding on which chocolates are my favorite, but I do think cream-filled chocolates are right up there vying for the top position. They are a little bit more fiddly because you have to temper the chocolate to get the very best results, but they sure are worth it! Once you have chosen your mold and decided what type of chocolate you will use for molding, you are well on your way. Follow the step-by-step guidelines to molding chocolate candy. I think you'll be pleasantly surprised to discover it really isn't too difficult if you adhere to some basic principles. Chocolate candy making molds are a wonderful bit of fun! I wish you all the best as you dive in and give molding candy a try. Be sure to take pictures and show us your masterpieces! Designed A Chocolate Candy Mold Creation? What kind of chocolate candy molds have you used? Do you have a favorite brand? Any special secret tips for success in molding chocolate candy? Got a masterpiece you are just dying to show off? Even disasters can be great fun to share! Well, don't be shy or stingy! We are dying to see it, too. 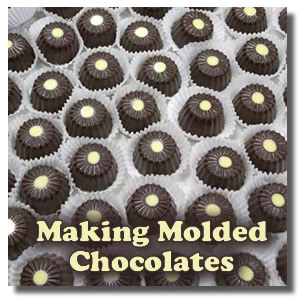 Use the form below to tell us your chocolate candy making mold experiences. Chocolate lovers from around the world will thank you! Enter Your Title (Example - "Chocolate Molded Cowboy Boots"
Where can I buy the molding containers? Why am I having trouble melting my colored melting wafers? How Long Can I Keep Molded Chocolates? Who can help me make the molds? How Much Chocolate Do I Use? How Do I Sterilize Molds? Why would dark and milk chocolate collapse and form a hole in the mold around the lollipop stick? Why is my candy dull when it comes out of the mold? How long will chocolate lollipops stay fresh? How long will chocolate lollipops stay fresh after making them? Pictures of my first batch of homemade candy! At what temperature is chocolate tempered? Can I Use Jelly To Fill Chocolates? What can I use to write letters on a lollipop? How long will homemade chocolate suckers stay good in the fridge? What kind of chocolate can be used in chocolate candy molds?